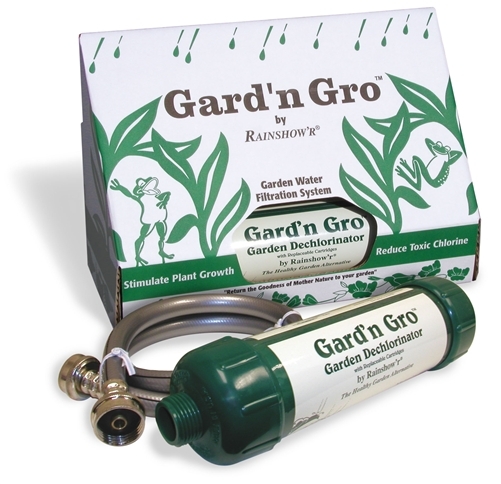 Rainshower Gard'n Gro GG-100 garden dechlorinator Water Filter System. Gard'n Gro water garden filter effectively removes 85% of the chlorine from garden hose water. Also great for bathing pets, summer time kid sprinkler activities, and for washing cars. Highly chlorinated water can kill microorganisms in the soil that are there to protect the plant and its food source. Now it is possible for home gardeners to stay away from chlorinated water. Can be used for sprinklers or kiddie pools. The filter converts free chlorine to a harmless chloride. Its unique "redox" media of copper and zinc works on the principle of electrochemical oxidation reduction. The Filter is completely non-toxic. The "redox" media will remain effective for hundreds of usages. The Filter will process a minimum of 20,000 gallons of water which can be more than doubled by following simple maintenance instructions. Orders processed on the next business day. In-stock items will ship within two (2) business day.